We should always follow safety rules and first aid to be careful in our daily life. Staying away from any harm is called safety. To be safe, we should be careful all the time. Most of the accidents are caused due to carelessness. All of us must learn safety rules. We must follow safety rules in our daily life. Safety rules keep us safe. While at home, we should not play with match-sticks. After using match-stick; put it out and throw it at a safe place. We should not touch switches and plugs with wet hands. We should not play with electric switches or appliances. We should not play with sharp and pointed objects like scissors, shaving blades and knives. Stay away from fire, it may cause burns. We should not touch chemicals, insecticides or any unknown bottle. We should not throw anything here or there. Keep everything at their proper places. We should not push or pull one another while climbing on stairs. We should not climb on desks and chairs in the class-room. We might fall and get hurt. We should sit quietly in the class-room. We should not throw chalks at one another or destroy school property. We should always obey our teachers. While going on the road, we should keep to our left. We should not run on the road. We should not walk in the middle of the road. We should always walk on the footpath. We should always stand in a queue while waiting for a bus. We should walk in a line, otherwise anyone else might fall and get hurt. We should not board or get down from a moving bus. We should not keep any of our body parts out of a moving bus. We should not throw anything out of the bus window. We should carefully watch the traffic light before crossing the road. We should always cross the road at the zebra crossing or use the pedestrian crossing. The white and black strips on road are called pedestrian crossing or zebra-line. Cross the road only when the pedestrian light is green at the zebra crossing. We should always follow the traffic light. 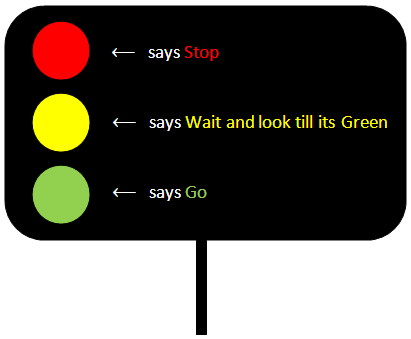 What does a traffic light tells us? RED light tells us to ‘Stop, Stop, Stop’. YELLOW light tells us to ‘Wait and look till its GREEN’. GREEN light tells us to ‘Go’. If there is no traffic light or zebra-line then first look to your right, then to your left and again to your right and cross the road when it is clear. We should not play on the road. You should play in the playground. We should not fly kites on road. We should not run after kites on the road. We should walk carefully on wet and slippery roads. We should be careful on rainy days. We should not play near railway crossings or near open drains. We should never go for swimming alone. We should not go in very deep water while swimming. Always use a swimming tube while swimming in a pool. We should not tease animals. They might harm us and we may get hurt. We should not throw banana peels on the way. First Aid means the immediate help given to a person who gets hurt. When you get injured, report to your elders at once. Always keep a first aid box at home and in classroom. If anyone meets with an accident on road, call a doctor or ambulance immediately. If a person’s clothes catch fire, cover him/her tightly with a thick blanket. In case of snake bite or insect bite, wash the wound with soap solution. If a person gets a cut on his/her body then first wash the wound and then put a dry bandage over it. A first aid box should have cotton, antiseptic cream, painkillers and packs of bandages.